I see so many "Oh yeah, I have GOT to try that!" recipes online at my favorite blogs and sites. I save them to my BigOven files "to try soon". But then I almost never get around to making them because I am busy playing around with my own recipes. I might actually make one of them for every 100 that I save. This is recipe is one of the few to escape the purgatory of my "to try soon" list. Last March Erica of My Columbian Recipes blogged about Cerdo al Caramelo, a dish her mother made in her home town of Antioquia. 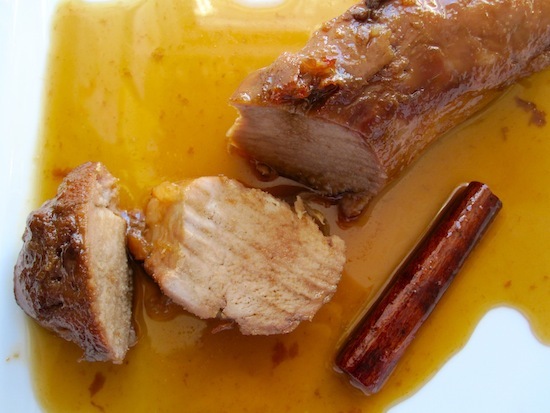 It's roasted pork bathed in a luxurious caramel sauce. Of course I took Erica's kitchen based version of Cerdo al Caramelo and converted it for the grill. Her version is less complicated, faster, and done in the kitchen so click on that link if you don't want to fire roast it. I chose to slow roast my loin at 250f for as long as possible before raising the heat to make the caramel sauce. That is because the two enzymes (calpains and cathepsins) that break connective tissue in meat are more active at internal temps under 105-122f (McGee 3954*). So the time the meat lingers under 120f acts as a sort of "accelerated aging" process, resulting in a tender, juicy roast (McGee 4494). Brine the roast for 4-6 hours, refrigerated. Pulse the paste ingredients in a blender or food processor until they form a...you guessed it, paste. Remove roast from the brine. Rinse and dry thoroughly. 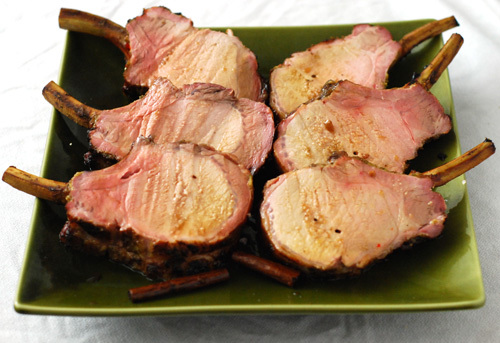 Leave at room temperature for 1 hour. Stir sauce ingredients in a grill proof roasting pan that will hold the pork roast. 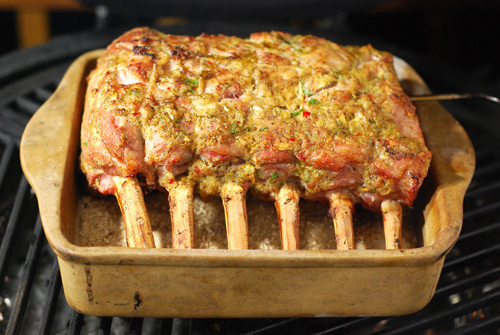 Place the pork roast in the pan and return to the grill, still on indirect heat. Adjust your vents (or gas) to bring the grill temp up to 350f. Roast until the roast reaches an internal temp of 135f. 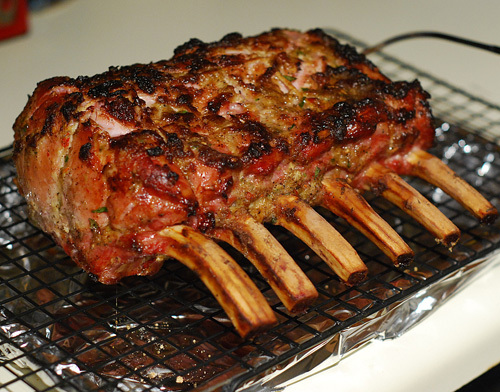 Remove roast and allow to rest, bone side down, for at least 15 minutes. Stir the sauce to make sure the sugar thoroughly combined into the sauce. If not, put it back on the grill while the roast rests, stirring occasionally. Substitute 2 tsp of red pepper flake if you don't have dried red chili. 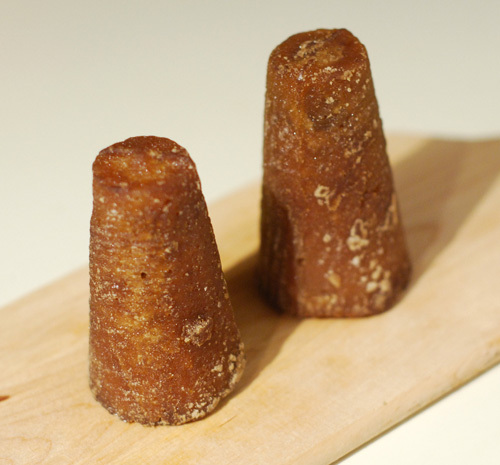 Do NOT substitute turbinado sugar for the piloncillo or brown sugar. I used a cup of piloncillo and a cup of turbinado. Seemed reasonable. It took the turbinado forever to melt. Big Green Egg set up was: lump coal to top of fire ring, 2 chunks cherry wood, plate setter legs up, drip pan, cast iron grate. The slow roast took about 2 hours and 15 minutes. A similar bone in pork loin last year done at 350f the whole time only took 1 hour and 30 minutes. I'd say the difference in texture was worth the extra 45 minutes. The "carryover cooking" during the rise maxed out at 151f about 20 minutes after coming off the grill. 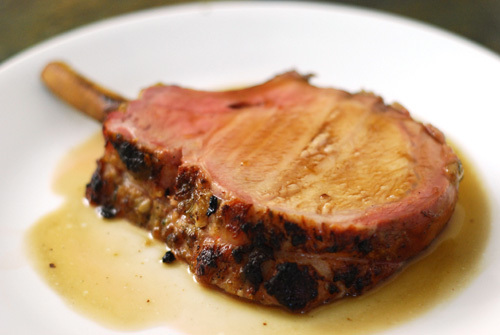 The pork roast was very juicy, extra tender, and flavorful. The sauce was rich and sweet, but not too sweet. Very worthy of a holiday meal. Pork roast getting its "beauty treatment". Piloncillo must be Spanish for "Grates as easy as hardened cement" but it's a mild tasting sugar. I cooked it right on the grate during the low temp roasting portion so all sides were exposed. I used stoneware for my roasting pan. Was just about to add the liquids here. 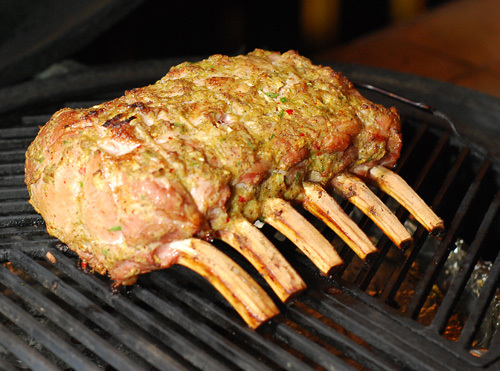 Resting on a raised rack helps retain the juices inside the roast. 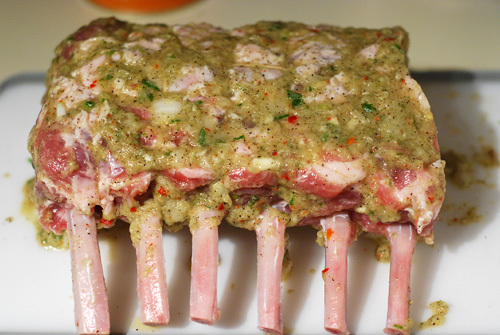 Plan for 1 rib or 3/4 lbs per person.